It is difficult to critique a book on criticism without entering into the realm of giddy, reflective post-modernism. 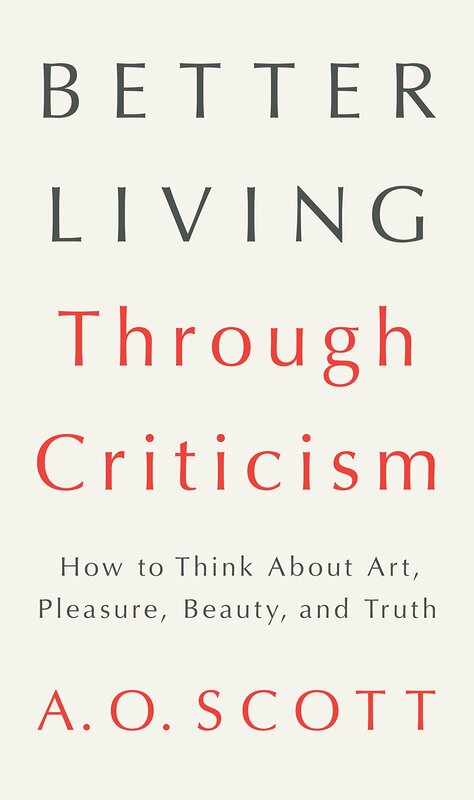 Yet, Better Living Through Criticism is unflinching in this regard, acting as a book about criticism which sometimes criticizes the critic writing it. This brings to mind Tropic Thunder where Robert Downy Jr’s character says, “Who am I? I know who I am! I’m a dude, playin’ a dude, disguised as another dude!”. Let’s add another level to that. In many ways Better Living is a way for A.O. Scott to talk about his favorite things with an audience where he controls the content and sets expectations – rather different than writing for The New York Times where content is decided for him. Making the most of this, Scott discusses art as a concept, poetry, the novel, performance art, sculpture, film, animation and, of course, criticism and its role. 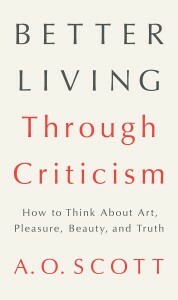 Really, this book is an eloquent and rich answer to the question posed early on in the book – what is criticism for? Why do we need critics? Surely this question has more often been asked as a snide rebuttal to a critique rather than as an honest inquiry, but Scott treats the question seriously regardless of intentions. The short answer is that criticism is inescapable, as flippant as it is necessary, and that we all act as critics whether or not we mean to. Therefore, criticizing well is critical. “Q: You have said a great many things about criticism—that it is an art form in its own right; that it exists to enhance the glory of the other arts; that it is an impossible activity; that it is necessary and vital to human self-understanding; that it can never die; that it is in perpetual danger of extinction—and you have said even more about what criticism is not. It is not mere faultfinding or empty praise. It is not just the expression of personal tastes and judgments. It is not science or philosophy or politics or poetry, though at various times it mimics all of those things. But to be frank I’m still not sure I know what criticism is, unless it is whatever a critic happens to be doing. And in that case what is a critic? So, okay. What is a critic, then? A champion (of). A detractor. A pest. An amateur. A super-fan. All this and more! By the end of this aesthetic investigation, A.O. Scott gives us a very soothing message – one that is philosophical in a way that can be lived and not only contemplated as an abstraction – that we don’t need to solve every paradox, that things that seem to exist in opposition actually exist in tandem, with every possible iteration, contradiction, agreement or coincidence accounted for an embraced. This is not merely a truth of art and criticism, but of everything we encounter, every chore we undertake. The title becomes very literal and, taken to heart, could very well fulfill the promise that it makes.